Emily Kordovich is interested in photography and cinematography and has completed many student projects during her time at RIT. 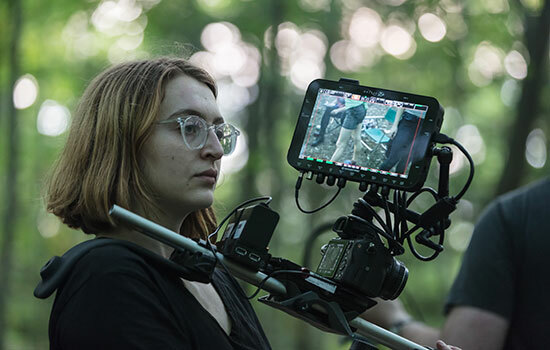 Emily Kordovich, a fourth-year film and animation and advertising photography double major from Holley, N.Y., recently attended the a2ru student summit. A2ru, the Alliance for the Arts in Research Universities, organizes student summits to bring together people who are interested in the arts and crossing disciplinary boundaries by collaborating on projects. An annual event, the summits provide a unique weekend-long collaborative experience with discussion panels, speakers, networking opportunities and other activities that help students become better collaborators and to tackle larger challenges. This year, Kordovich traveled to Louisiana State University in Baton Rouge, La., to attend the summit. Outside of her heavy double major course load, Kordovich has many unique interests. She is learning French and Japanese and enjoys creative activities like drawing and making music. Currently, she is involved in a “low-key band” called Twisted Nips as the lead singer and sometimes song writer. Some of Kordovich’s photography, her main passion, is available to view on Instagram and her website. Question: How did you come to be involved with the a2ru summit? Answer: A professor reached out to me and specifically said, “I know you’re very interested in interdisciplinary subjects,” because I’m a double major and like to over-exert myself. She told me this cool thing was happening and I should try to be a part of it. Then I simply applied and got in. I just had to explain what I would do, why I thought I would fit in at the summit and what I would bring to the table if I was to attend. Q: Each year the conference has a theme; can you describe this year’s theme, “Spectacle and the Collective Experience”? A: A2ru has been trying to bring students in to think beyond school work and their own personal work, so the idea of “Spectacle and the Collective Experience” targeted at approaching a social issue. They want us to be able to say something about it, raise money or do something that is helpful and will bring awareness. It was working within that realm, and it was very open. Q: Why do you think cross-disciplinary work is valuable? A: I have always had an interest in what is beyond my own skill set so I can improve my outlook and perspective, and to better understand all aspects of the world. So being interdisciplinary is really important. Being an artist, I have one view, and someone in a STEM major has their own view. When you combine those views, you can have something really incredible because both of you will be looking outside of your own realms. I’ve been part of a group called Thought at Work, which is a student-organized design conference at RIT, and it’s mostly designers, but I’m a photography and film student. I just have a really deep interest in design and I think it makes my photography and film work better. So I think interdisciplinary collaborations and viewpoints makes me better. Q: How would you describe your experience at the summit? A: It was definitely very interesting. I met lots of people and I think that was the most important thing, meeting all these people from all different parts of the country and some other parts of the world who had these different outlooks, opinions and views. That just opened my mind and helped me think deeper and differently. I feel different, I would say, because of these new perspectives that I can continue exploring. I know that there is more than just what I think and what’s in my head. Q: Can you tell me about the project you worked on and presented? A: We only had three days to come up with our idea and we didn’t have all of the details ironed out, but the main idea is focusing on bringing people together through a spectacle, and that spectacle was going to be a jazz concert of sorts. Jazz back in the 1920s brought all kinds of people together. It brought together the very rich and the very poor. That’s an interesting divide we have going on in our country now, as well as other things, and we all sort of landed on finding a way to bring all kinds of people and different communities together through jazz. Q: Did you enjoy working with students from different universities who had different majors than your own? A: Saying I enjoy it would be a stretch, but working with people who may not be on the same wavelength as you or who aren’t in your major or you haven’t worked with before pushes you to be more understanding of their viewpoints rather than just saying, “No, I’m right and you’re wrong because we have different opinions.” It took a lot of patience, but I think it makes me a stronger team member and a better collaborator. I appreciate the experience. Q: What speaker did you find most interesting? A: In the end, I actually think the most interesting ones were the pop-up talks given by students. The students had such interesting things to say, especially this one student, Miriam Simon. She goes to MIT and is doing her master’s thesis project on the idea of trans-humanism. She talked about how she wants to become a cephalopod and how cephalopods are underappreciated in their crazy adaptability and intelligence. She explained how the world is going under water and that she wants to adapt to that. She talked about how we could someday find a way to adapt so people can live underwater. I think the students brought something to the table that was different. Q: What are three things you learned at the summit that would be helpful for other students to know? A: The first is that it’s very important to speak your mind in a group setting. There is a point where you need to compromise, but you really need to stand by your vision that you want people to understand, don’t just back down if someone says no. However, you also need to be understanding. In an ideal group situation, you will have your strong opinion and someone else will have their own strong opinion, but you will understand each other. Then, somehow, you will reach that golden place and that perfect balance of understanding and creativity. Second, never ever be afraid to talk to the people around you and to socialize. If you just go up to somebody in this sort of situation where no one knows each other and you say hi, chances are they are just as spooked as you are and they will be open to talking as long as you’re genuine and are open to making a connection. Lastly, be aware of what you say and do. Some people have no idea or sense of self-awareness, and that can be very dangerous in a group setting because you may be cutting off people. Having that knowledge and awareness for yourself and respect for those around you is so incredibly important.